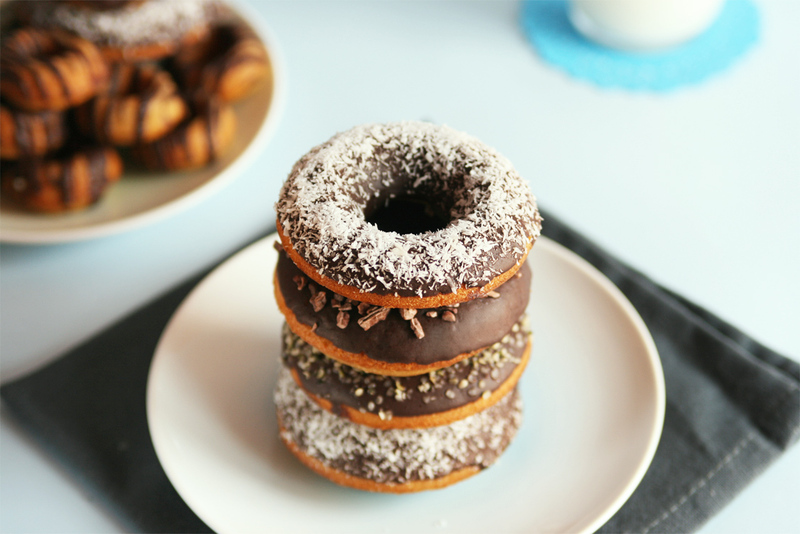 I've been wanting to publish a donut recipe for so long and finally I can share these gluten-free baked donuts with all of you! It took me several tries to get them right, gluten-free baking is no joke especially when you want to customize and create a healthier version of an old recipe. 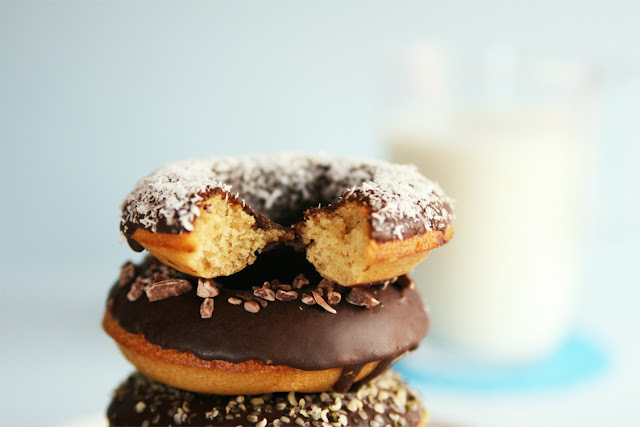 But I honestly think these donuts taste pretty damn good and they aren't loaded with refined sugar, tons of butter, etc. Plus they are baked, which means you're cutting down on calories and fat...so we can all agree to say they are very much guilt-free. Wish I could have one of them right now to go with my cup of rooibos chai latte, but as you can guess they were all devoured in the blink of an eye. 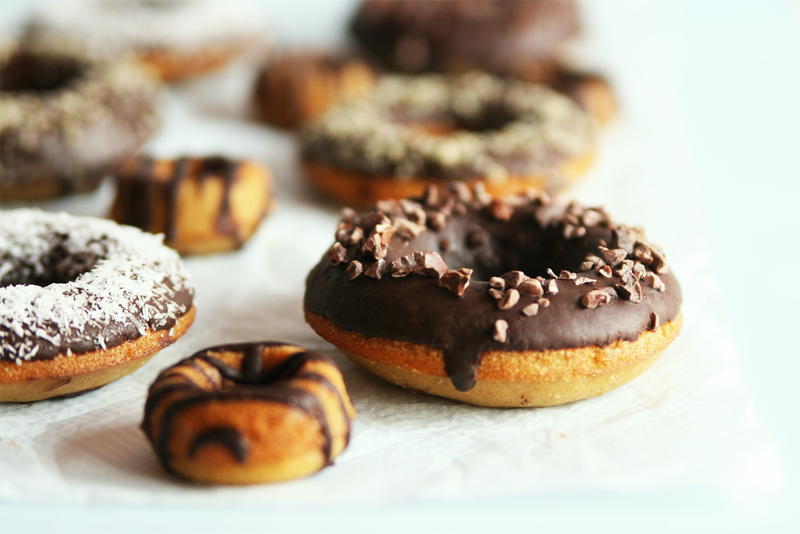 Who can resist to freshly baked donuts?! Not me! Now I'm off to feed my tortoise Tomi, prepare a quick chocolate chia pudding with whipped coconut cream and think about what flavor will I pick for my next donut recipe. To all my vegan followers, don't worry cause I'm also working on a plant-based recipe! ¡Puedes leer la receta en español aquí! 1/2 cup brown rice flour. 1/8 to 1/4 teaspoon ground cardamom. 2 free range eggs, at room temperature. 3/4 cup mild-tasting extra virgin olive oil. 1 cup dark chocolate (70-72% cacao), chopped. - I like to use very little amounts of cardamom, but if you really like its aroma increase the quantity to 1/4 teaspoon. - You can replace the oat milk with almond milk. - When it comes to baked desserts I always recommend using extra virgin olive oil made from arbequina olives, it has a fruity aroma and doesn't have that kinda bitter aftertaste like other extra virgin oils tend to have. 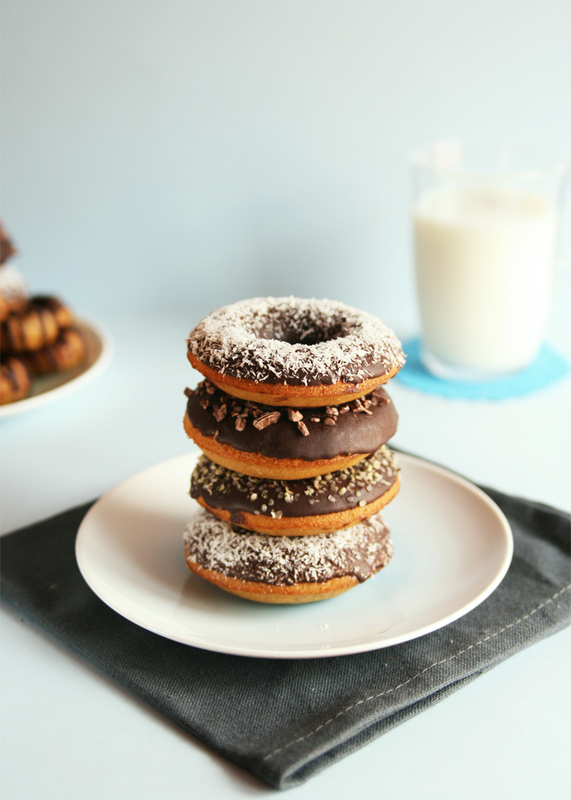 - The recipe yields an approximately 12 normal-sized donuts. For size reference, this is the pan I used (this is NOT an affiliate link). 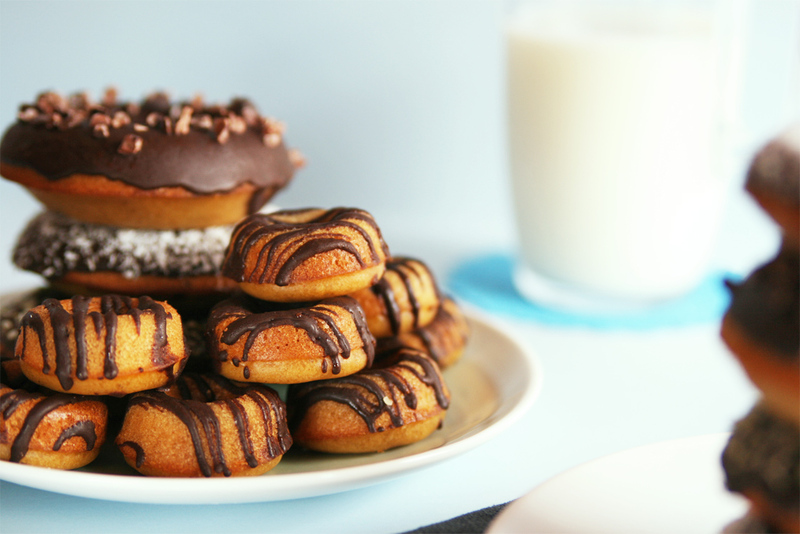 I made extra dough to bake some mini donuts only for photography purposes, so depending on the size of your donut pan you will get some extra donuts or a little less. Preheat oven to 215 ºC (419 ºF) and lightly grease two 6-cavity donut panswith nonstick cooking spray. In a large mixing bowl combine the flours, starches, baking powder, spices and salt, using a whire whisk until well combined. In a medium mixing bowl whisk the coconut sugar, eggs, oil, milk and apple cider vinegar until light and frothy. Add the wet mixture to the dry ingredients and stir with a silicone spatula or a hand whisk until combined. With the help of a pastry bag to make the process easier and quicker fill each cavity about two-thirds full and bake for 8 to 10 minutes. 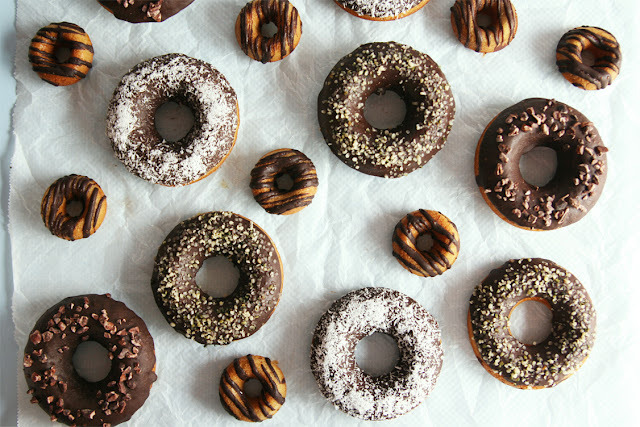 Donuts should be light golden, if you want tender and soft donuts I don't recommend baking them more than 10 minutes. Let the donuts cool in their pans for 5 minutes and then transfer to a wire rack to cool completely. Melt the dark chocolate in a double boiler, remove from the heat and stir in the cacao butter. Set aside until donuts have cooled. Line a baking sheet with parchment paper and place a wire rack on top. 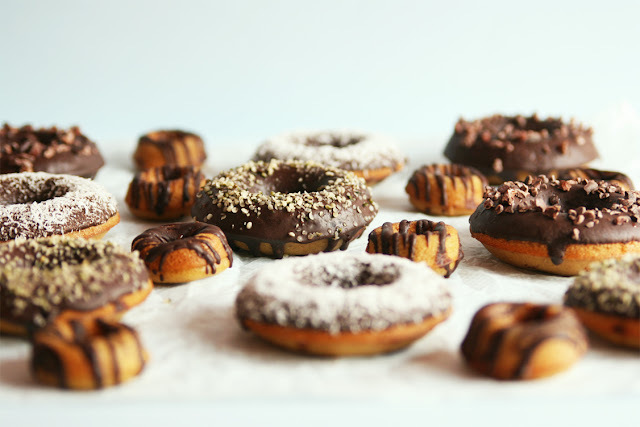 Dip each donut with your hands into the melted chocolate glaze and transfer them to the wire rack. Sprinkle with the suggested toppings and wait until the ganache is completely set before storing them. 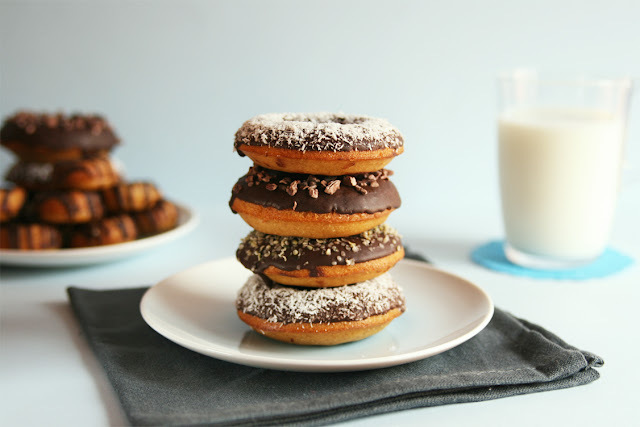 These donuts are best enjoyed the day you make them but you can store them in an airtight container up to 2 days at room temperature. I think you may have outdone yourself this time, Gemma. These look so, so , so freakin' good! I would high five you if I could, instead I'll give you a virtual high five. :) Love that you added cardamom too! Thanks a lot darling!! Your comment made my day. Yeah, I have a tortoise named Tomi (I named him after Amorphis singer Tomi Joutsen, haha. It's a finnish metal band). I have some pics of my tortoise on my Instagram page.